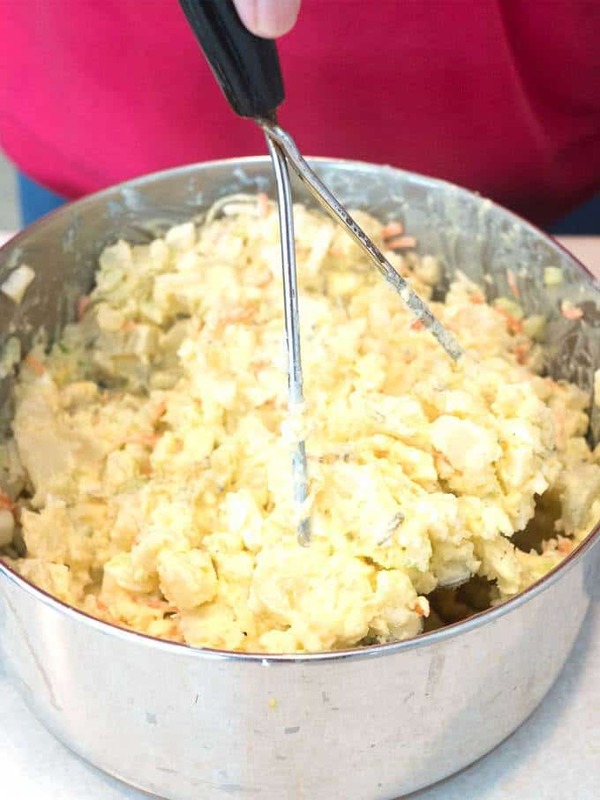 We do a lot of things right in the South, especially when it comes to Potato Salad! 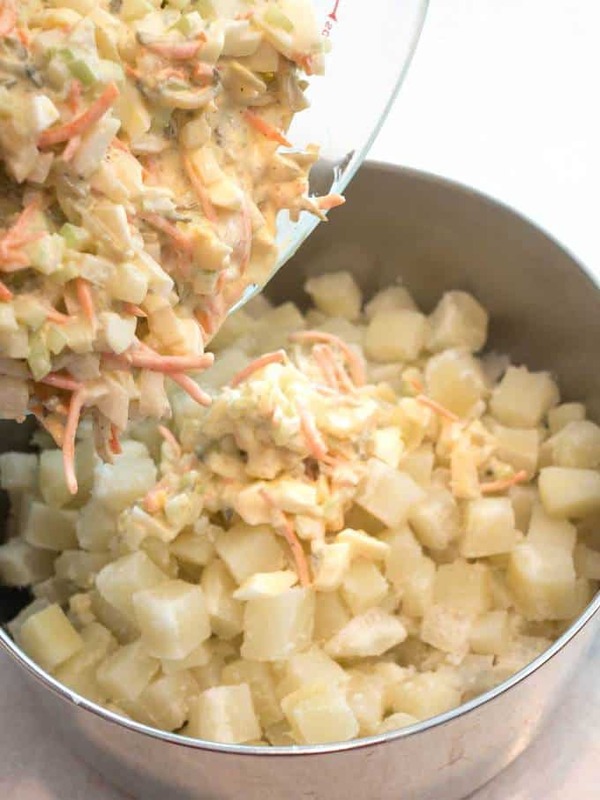 This classic Southern Style Potato Salad with a Twist is perfect for Easter brunch or dinner, or anytime for that matter. It’s good served warm, but even better served cold after the flavors have had a chance to meld together! What’s the “twist” you might ask? Well, it’s the addition of shredded carrots for color and a very subtle taste, and the use of dry mustard in place of prepared mustard. It’s also the Master Taste Tester lightly breaking up the potatoes with a potato masher to perfectly blend all of the ingredients together! I’ve been making this potato salad longer than I care to remember. Whether I serve it at home, or take it to a pot luck, it’s always a huge hit. In fact, the Master Taste Tester’s face always lights up when I announce that I’m going to make a batch of potato salad! 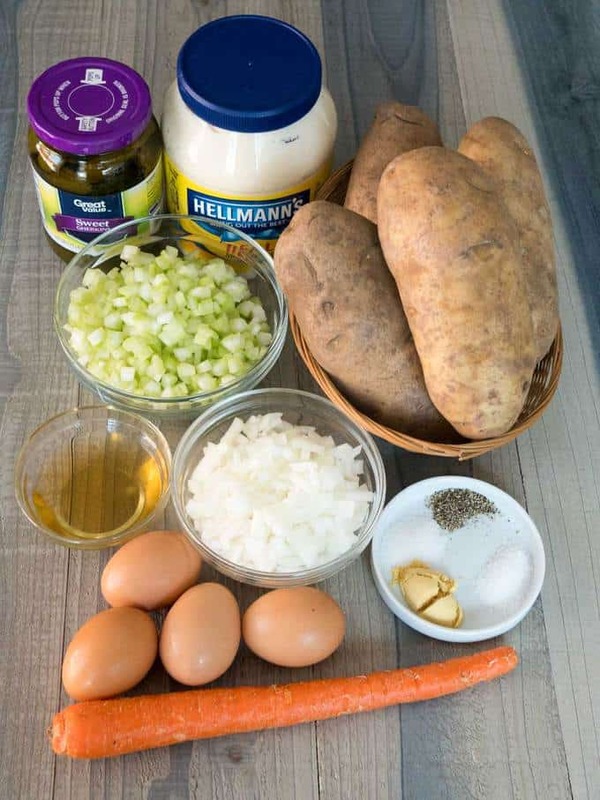 I used the following ingredients: Russet potatoes, mayonnaise, apple cider vinegar, sweet pickle or gherkin juice, salt, freshly ground black pepper, dry mustard, sugar, hard-boiled eggs, sweet pickles or gherkins, carrots, onions, and celery. I started by peeling and cutting the potatoes into about 1-inch cubes. Then, I added the potatoes to a 4-quart saucepan, and covered them with salted water. I brought the water to a boil, lowered the heat to medium, and cooked the potatoes until they were soft. This took about 20 minutes. When they were done, I drained the potatoes in a strainer. While the potatoes were cooking, I made the dressing. 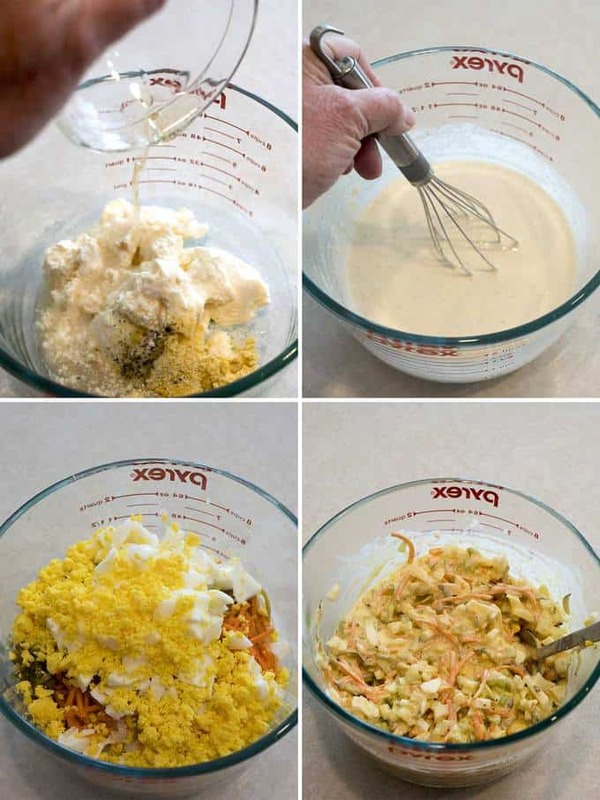 To do this, I started by adding the salt, pepper, dry mustard, and sugar to the mayonnaise. I generally do this in an 8-cup measuring cup, but could just as easily use a large bowl. Then, I added the vinegar and pickle juice, and whisked the mixture to combine everything. Next, I added the onions, celery, shredded pickles, shredded carrots, and eggs. I gave the mixture a stir to ensure that everything was well mixed. To save on cleaning, I rinsed and dried the pan that the potatoes were cooked in. Then, I dumped the cooked and drained potatoes into the pan. Next, I poured the dressing over the potatoes. I used a wooden spoon to mix all ingredients together. As a final step, the Master Taste Tester plunged the potato masher into the mixture five or six times. In the early days, I worked incredibly hard to ensure that the potatoes were perfectly cooked to retain their shape. However, one day, the Master Taste Tester pulled out the potato masher and to my horror, proceeded to “mash” my perfectly formed potatoes! The result, however, was really good. It caused the potatoes to somewhat “soak” up the dressing and produced a creamier potato salad. From that day on, I’ve called on the Master Taste Tester to use the potato masher in the last blending step. As a final step, I transferred the potato salad to a bowl, and covered and refrigerate it. 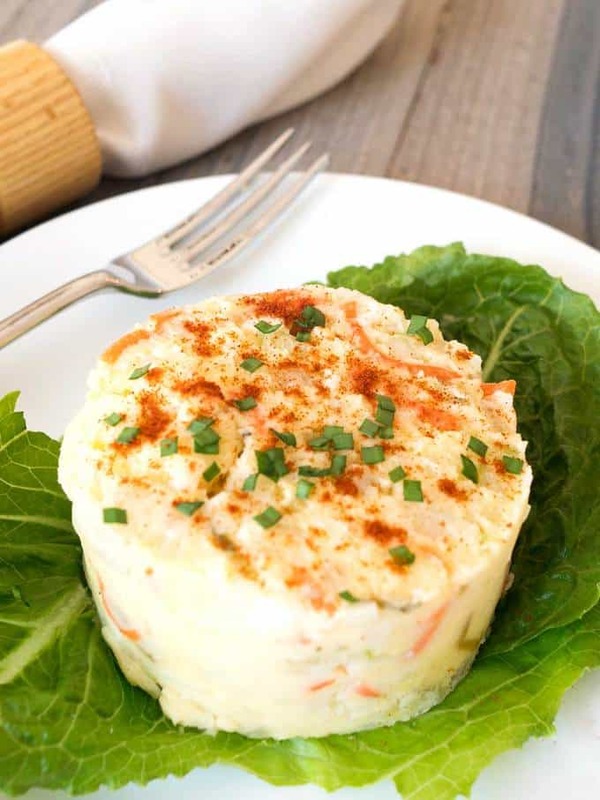 This classic Southern Style Potato Salad with a Twist is perfect for Easter brunch or dinner, or anytime for that matter. Yum! With Easter just around the corner, I decided to update this post from March 20, 2017. In this updated post, I tweaked the text a bit, and added a video. I hope you have a Happy Easter! Add water to cover potatoes and 1 tablespoon Kosher salt. Cook potatoes in salted water until done (should be soft, but not mushy), 15 to 20 minutes. Pour into colander; rinse well with cold water and drain well. Place in a large bowl. In a medium bowl, mix mayonnaise and remaining ingredients, stirring well to combine. 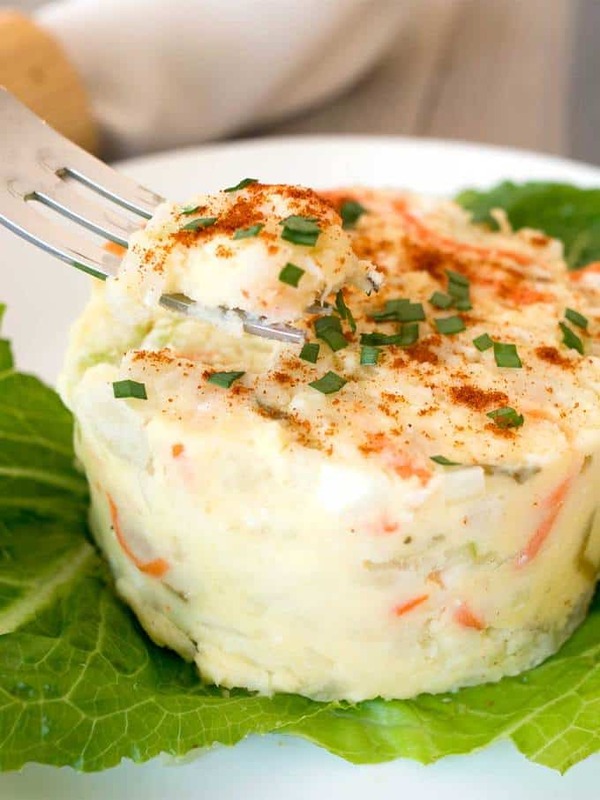 Pour mayonnaise mixture over potatoes; toss gently with a wooden spoon until potatoes are thoroughly coated. Plunge a potato masher five or six times into the mixture, to lightly break up potatoes. Cover, and chill thoroughly. If desired, garnish with paprika and chopped chives or chopped parsley. Yield: 10 to 12 servings. For Perfect Hard-Boiled Eggs every time, steam them.